Uncle Joe (Joe Underwood), despite being a Member of the ‘Drivers’ Group, will not even see this Activity on the Calendar. Role – Leaders always have all Permissions and may not be changed. 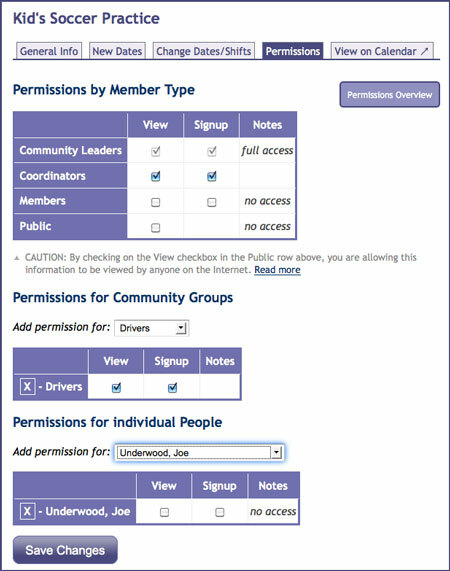 The Public Role may only be granted ‘View’ Permissions. Individual People – This category is for exception handling: you may assign – or remove – Permissions for any number of individual people in the Community (Leaders, Coordinators, and Members), where the Permissions need to be different than those applied to a Member’s Role or Groups.